Online ordering menu for JoJo's at the Donkey. 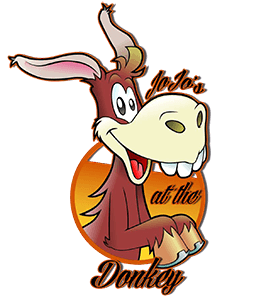 JoJo's @The Donkey, a Scranton based and family owned business, is committed to providing excellent food in an outstanding setting. Grab a bite of one of our signature burgers or eat our mouth-watering wings. Order online for carryout today! Located on the corner of Grace St and Brighton Ave, just west of Lackawanna River and next to Strange's Food Center.